So what actually happens is more complicated (and thus so much cooler) than that. Basically I skipped a bunch of steps and put materials in the wrong order. This may have made my point (materials go simple to complex) more neatly but the truth suffered a bit. The first thing is (and I knew this when I wrote the original post but I didn’t articulate it as I should have) — these things don’t happen one at a time in order. I.e., the child doesn’t do one thing and THEN the next thing and THEN the next thing. Rather they overlap and leave and come back and do complimentary work simultaneously. That’s part of the joy of it all. The second thing is that I did skip a couple of steps and I should have made that clear. The children don’t start with the small number rods. 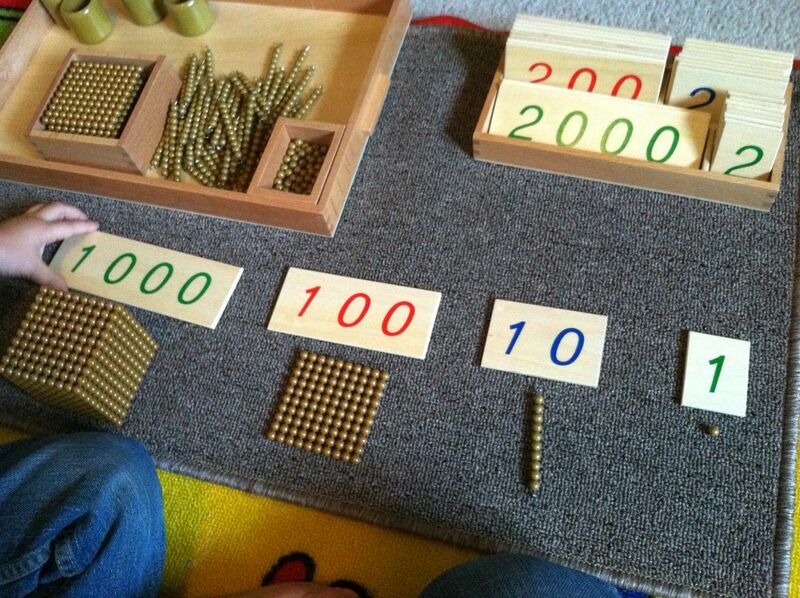 And in that way the children move through the materials, adding complexity as they go. Thank you for reading this corrected post and my apologies for any confusion that my previous post may have caused.